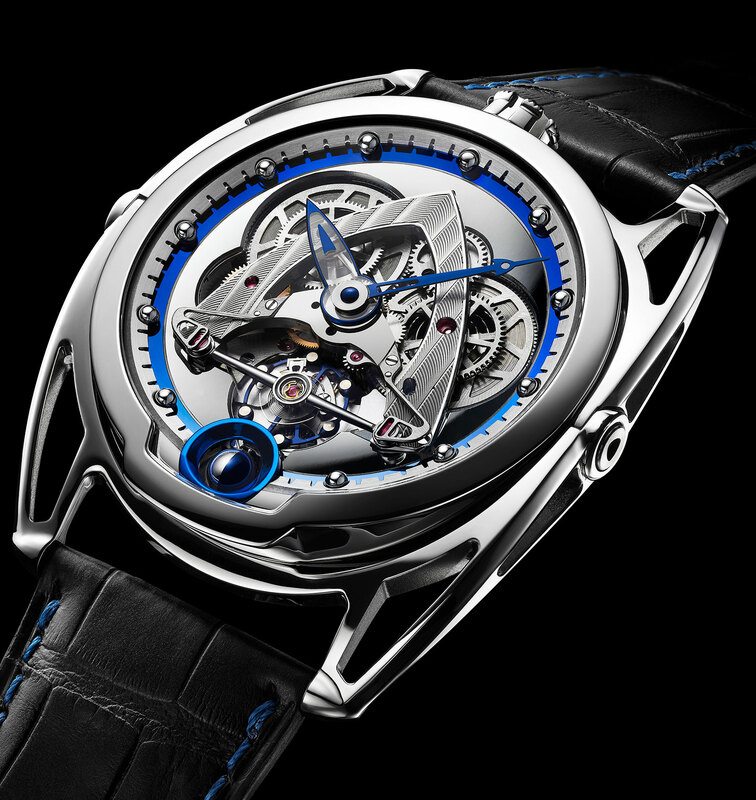 A skeletonised front on De Bethune's signature timepiece. Characterised by spring-loaded lugs and lots of mirror-polished titanium, the DB28 is De Bethune‘s best known wristwatch. It’s been iterated into dozens of variations, from a jumping hours to a meteorite dial. Now the DB28 gets a skeleton dial that reveals the mainsprings and gear train of the DB2115V4 movement. The very first watch introduced by De Bethune’s new owners, the DB28 Steel Wheels combines several well-known design elements favoured by the brand. De Bethune’s trademark delta-shaped barrel bridge has been open-worked into a “V” and Côtes De Bethune, an engraved motif that resembles Geneva stripes. And below that both barrels re also open, revealing the two large mainsprings responsible for the six day power reserve. Unusually the hour hand is clear sapphire with a blued steel border, while the minute hand is spear-shaped blued steel. 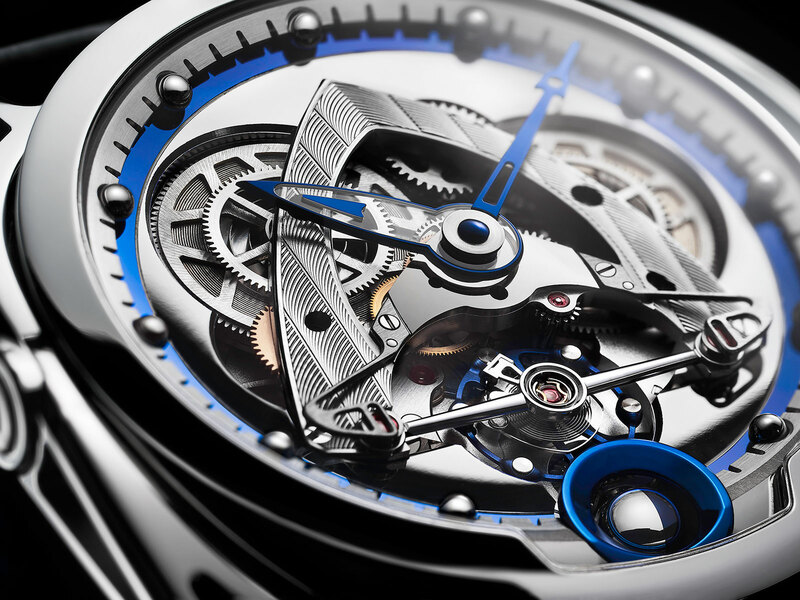 They point to spherical titanium hour markers on a blued titanium track, both recurring motifs on De Bethune watches. The rest of the watch is largely identical to the standard DB28. It has a spherical moon phase at six o’clock, and just above that, the brand’s proprietary balance wheel in titanium with white gold masses. 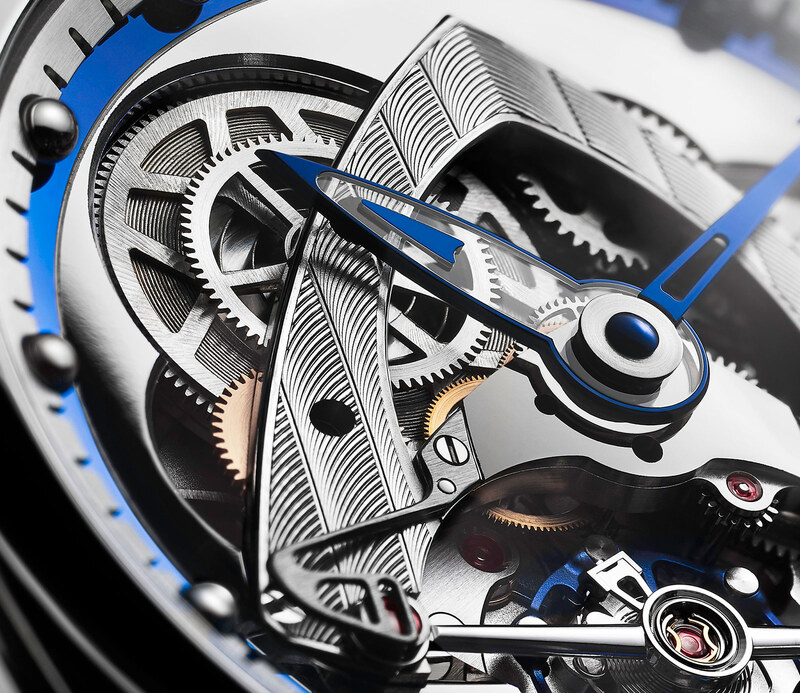 It’s just in place by a tubular balance bridge that features De Bethune’s triple pare-chute shock absorber. The case is titanium and 42.6mm in titanium, with the option of long or short “floating” lugs. The DB28 Steel Wheels is a limited edition of 25 watches, priced at SFr83,000 before taxes. Inspired by the ornate French clocks of the nineteenth century, the De Bethune Digitale is a jump hour with wandering minutes and a spherical moon phase, fusing modern watchmaking with a classic horology.